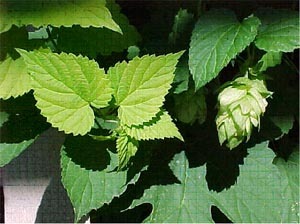 Medicinal uses: The bitter principles contained in hops stimulate the digestive system increasing gastric and other secretions. Also contains sedative and astringent constituents as well. Hops relaxes smooth muscle and has an estrogenic effect. Hops is commonly used as a sedative and can reduce restlessness and irritability. It is also good for reducing stress, anxiety, tension, and headaches (Chevallier 106). Additional uses: Commonly used to bitter beer. The cut and dried flower heads can be used in flower arrangements and wreaths. The flexible vine can also be used to weave baskets. The dried flowers can also be used as a stuffing in small pillows to help bring about sleep (Kowalchik 334). Cautions: Do not use if suffering from depression (Chevallier 106).